It was time for me to indulge in some D.E. Stevenson again. After all, it had been a few months! I went to an estate sale about a month ago and discovered the former owner of the house had very similar taste in books to my own. There I found one lone Stevenson book upon the shelf which I snatched up immediately. As an aside, I've been to a few estate sales recently where from the moment I walked into the house I knew that I was in a friendly place. The dishes were designs that I liked, the books were ones I had read or would want to read and other quirky things that make me both interested in and sad about the sales. In those instances, I didn't feel like I was purchasing things from a stranger, but rather that I've been gifted them by someone who would have been my friend, if that makes any sense at all. I feel like something has been passed down for me and mine to enjoy instead of simply "discarded." Does that make sense? Apparently I just needed to share that thought. Bear with me. As I was saying, I brought home Still Glides the Stream a few weeks ago but this past week have been down and out with a cold. I find that a D.E. Stevenson book is perfect medicine when sick. Per usual, I was drawn into her story within the first chapter and proceeded to devour and enjoy the entire book in short order. Stevenson makes for such easy reading. 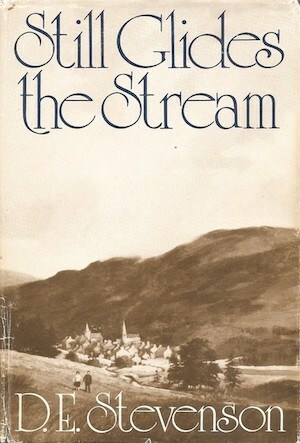 Still Glides the Stream is set in a small town on the Scottish border post-WWII. We meet the main character, Will Hastie, right away, as he is returning to his childhood home and estate after retiring from the Army. He quickly settles back down on the land that he loves, picking up an old friendship with the neighbors straight away. As a young boy, he used to play with a brother and sister duo in the neighboring estate. The brother, Rae, was killed in action during the war but his sister, Patty is still living at home with her parents. Will discovers very little changed about the neighbors except that they are still mourning the loss of their son and brother and that Patty is engaged to be married to a cousin of hers. Add to the story a mysterious letter from Rae to Patty that was mailed before his death and we have ourselves a plot line. Now, this is a D.E. Stevenson story and so it's all's well that ends well. There's nothing particularly stunning about the read - it's just pleasant! Stevenson is incredibly predictable (this makes her an excellent author to want to read when you aren't feeling so great and/or you just want to relax with a book) but she did throw a moderate surprise at me towards the end which was a pleasant surprise. As I'm typing out the fact that Stevenson is a predictable author, it occurs to me that L.M. Montgomery is the same and I'm starting to wonder at what it is that makes me love both of these female authors so very much. Both are good students of human nature and know how to write out both the thoughts and dialogues between characters in a believable fashion. They both add just a touch of humor to their tales, which I think matches up with real life being a serious business but with a laugh around the corner when you need one. I think I also am drawn to the fact that they tell their stories at a relaxed pace, allowing the reader to just sit back and take in the story. Both authors also love their homeland which is something I find terribly appealing. They take me out-of-doors, so to speak, and I can picture the surrounding in my mind's eye. They both appeal to the beauty which can be found in this world, All of these things contribute towards my like of them. Whatever it is that draws me to them, I like them for it and inevitably close their books with a smile on my face. If you've not yet read a D.E. Stevenson book, do! Still Glides the Stream is a great one to start with. It's hard to go wrong with Stevenson or Montgomery though so if you need a lazy book for a lazy day, look into one of these authors! They are sure to please. Yes, I understand how it could be a gift from a friend. Thanks to you, I've fallen in LOVE with the writing of D.E. Stevenson! I'm just starting Shoulder the Sky, so I'm looking forward to seeing how she ends that particular set of books. Sounds corny, but I really do connect with her characters like no others. Thanks for your encouragement to get in her books! I totally agree about estate sales, and that reminds me that it's been entirely too long since I've been to any. I'm so glad you found a good book to draw you in, even during this busy season of life. I enjoyed reading the specifics of what you like in a book.